VATICAN CITY (AP) — Pope Francis on Palm Sunday urged young people not to be silent and let their voices be heard, even in the face of corrupt or silent elders. The pope's message comes on the heels of a meeting of young Catholics who told the Vatican they want a more transparent and authentic church, and a day after hundreds of thousands marched in youth-led rallies across the United States to demand greater gun control. "The temptation to silence young people has always existed," Francis said. "There are many ways to silence young people and make them invisible. ... There are many ways to sedate them, to keep them from getting involved, to make their dreams flat and dreary, petty and plaintive. " But he told youths in his homily that "you have it in you to shout," even if "we older people and leaders, very often corrupt, keep quiet." As the Roman Catholic Church enters Holy Week, retracing the story of the crucifixion of Jesus and his resurrection three days later on Easter Sunday, Francis urged youth to join those who offer praise, and not the masses calling for crucifixion. "Dear young people, the joy that Jesus awakens in you is a source of anger and irritation to some, since a joyful person is hard to manipulate," the pontiff said. Some 300 youths meeting at the Vatican this week prepared a document for next October's synod of bishops at the Vatican focusing on to help youths better find their way in the church. The document, which was presented to Francis on Sunday, asked church leaders to address the unequal roles of women in the church and how technology is abused. Before his traditional Sunday prayer at the end of Mass, the pope recalled the importance World Youth Day, marked this year on Palm Sunday at a diocesan level rather than as a big international gathering. The pope's message also resonated with the Saturday protests across the United States for tougher laws to fight gun violence, a movement galvanized by the school shooting last month in Parkland, Florida, that left 17 people dead. 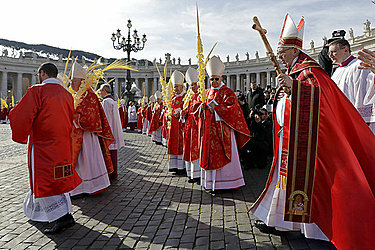 At the end of Mass, the pope and cardinals in red robes led a solemn procession clutching elaborately braided palm fronds as they walked through the throngs, followed by the papal blessing of palm fronds and olive branches. The processions recalls the bittersweet nature of Holy Week, with the faithful clutching simple palm fronds and olive branches to commemorate Jesus' triumphant entrance into Jerusalem only to be followed later by his death on a wooden cross. The pope concluded by greeting the faithful in St. Peter's Square, getting out of the popemobile to shake hands as many cheered and took pictures.